In accordance with its 2017 Annual Work Plan and within the framework of Statistical Capacity Building (StatCaB) Programme, SESRIC organised the Training Course on 'Development of Dissemination Methods' at the Central Statistical Bureau (CSB) of State of Kuwait on 11-13 December 2017. 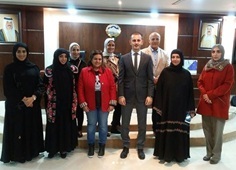 The Training Course was conducted by Mr. Serhat Atakul, Expert at Turkish Statistical Institute (TurkStat) of Republic of Turkey with the participation of 10 officials of the CSB of Kuwait. As defined in the Classification of Statistical Activities (CSA Rev. 1 - October 2009; http://goo.gl/olg3Tz); data dissemination and data warehousing includes, topics like policies, strategies, methods and techniques of data dissemination, design and organization of output databases and data warehouses, including feedback from users, communicating with the media, work of NSO press offices, data and metadata presentation, electronic dissemination (Internet), statistical portals. The subject area “Data dissemination and data warehousing” is currently classified under the “Methodology of data collection, processing, dissemination and analysis” domain.